The self-defense forces in Slavyansk have refrained from immediately freeing the detained foreign military observers they are calling "NATO spies." Russia’s Foreign Ministry has promised to do its utmost to accelerate their release. Russia’s Foreign Ministry said on Saturday that it is taking measures to resolve the situation with the detained military observers. The ministry pointed out that the Vienna document pins full responsibility for the security of observers on the receiving party, in this case Kiev. “It would be logical to expect from the present Kiev authorities a preliminary coordination of location of activities and safety of the inspectors in the areas where these authorities do not control the situation and where a military operation against the citizens of their own country has been launched,” the statement said. “Their detention would not help with defusing the tension on the ground and deescalating the conflict,” he added. A group of German negotiators have already arrived in eastern Ukraine for talks to set free the detained military observers, Itar-Tass quoted Germany’s Deutsche Presse-Agentur (DPA) news agency as saying. The detained team is "not OSCE monitors" but was sent by OSCE member states in accordance with the 2011 Vienna Document on military transparency, the organization explained on Friday. The current Germany-led group arrived to Ukraine on April 21 by Kiev's request. 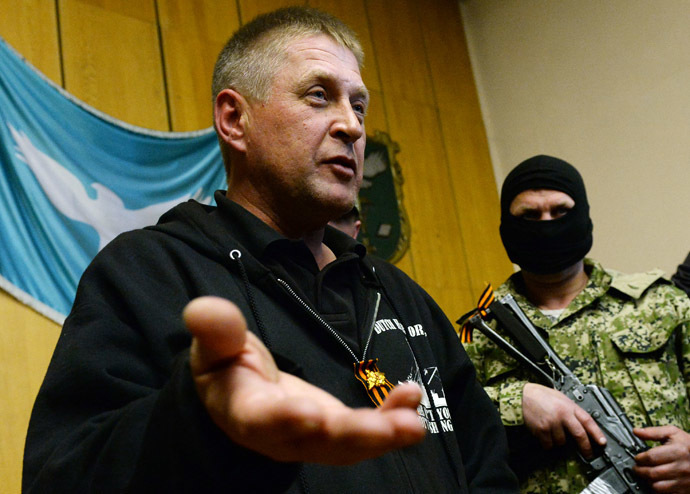 Speaking to journalists on Saturday, the “people’s mayor” of Slavyansk, Vyacheslav Ponomaryov, did not rule out that the group could be exchanged for anti-government activists that had been detained by Kiev authorities. “The Kiev junta has our fellows and comrades therefore, if there is a possibility, we are ready for an exchange,” Ponomaryov said, answering the questions of journalists on Saturday. “They are in alright condition. One of the soldiers suffers from diabetes, but it is not a serious condition, he is on tablets. There is medicine there is food,” Ponomaryov said, adding that they are still trying to verify the purpose of the group’s activities in Slavyansk. 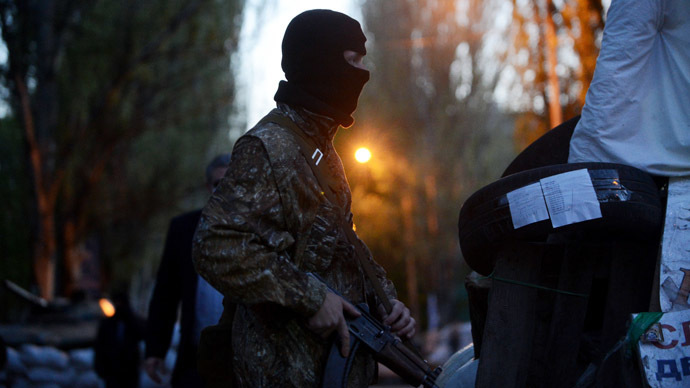 “The terrorists plan to use the hostages as a human shield,” Kiev’s statement claimed. The protesters said they detained eight officers of NATO member states – four from Germany, and one each from Bulgaria, the Czech Republic, Denmark and Poland. The group was accompanied by four Ukrainian officers, thought to be members of the country’s general staff. On Saturday a representative of the protesters told journalists that the detained officers had “maps of Slavyansk with checkpoints and barricades marked on them, dog tags and live ammo,” which proved they were acting officers gathering intelligence. The journalists were shown some of the documents of the detainees, in which the military observers are described as officers. The names of three of them are as follows: John Christensen (Denmark), Axel Schneider (Germany) and Krzysztof Kobelsky (Poland). With the preponderance of officers from NATO member countries in the group, they were branded “NATO spies” by the militia. NATO’s official spokeperson, Oana Lungescu, tweeted on Saturday that the alliance has no force deployed in Ukraine. A similar statement was made earlier by NATO Deputy Secretary-General Alexander Vershbow. The interim people’s governor of the self-proclaimed Donetsk Republic, Denis Pushilin, promised to send reinforcements to Slavyansk, which is currently besieged by Ukrainian troops. 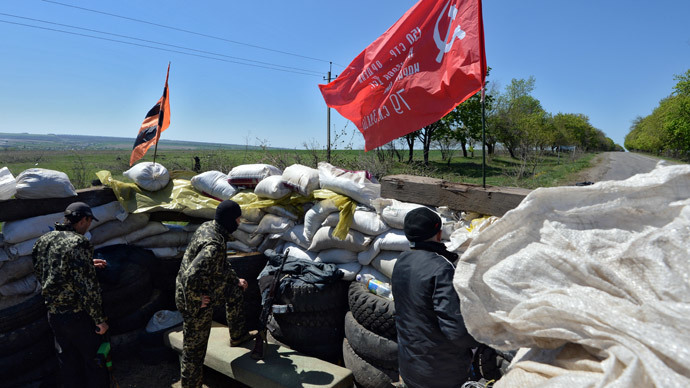 “We’ve reached an agreement on full coordination of actions in Slavyansk as the command of defense of Slavyansk has been handed over to the authorities of the Donetsk republic,” Pushilin said. On Friday, security forces loyal to the coup-imposed government in Kiev announced the beginning of the second stage of a “counter-terrorist operation” in the Donetsk region. They said the plan is to establish a full blockade of Slavyansk. According to Ponomaryov, the city is being defended by approximately 2,500 volunteers. 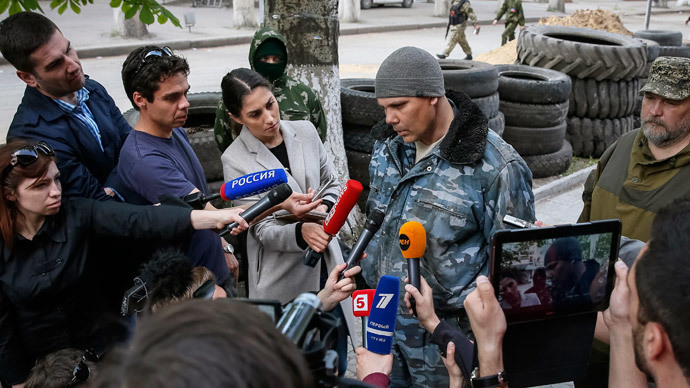 Earlier, the Slavyansk self-defense forces detained a number of people, including journalists, suspecting that they could be gathering information for the Ukrainian authorities or for the radical nationalists from the Right Sector movement. The suspicious attitude towards visitors is understandable, considering a number of fatal gun attacks on militia-held checkpoints the city witnessed in the past few days. 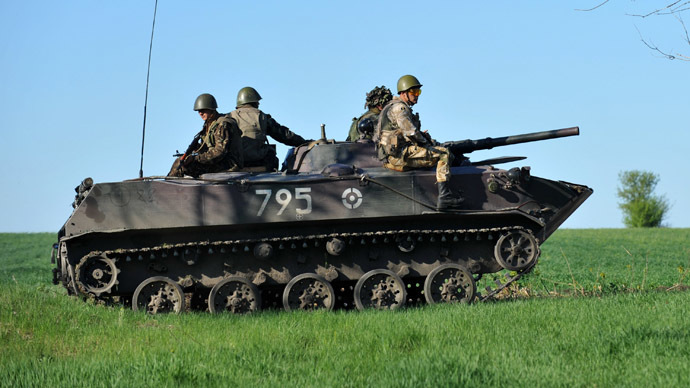 Some of the attacks were carried out by Ukrainian troops acting in an ongoing “anti-terrorist operation” against Slavyansk. The perpetrators of some of the others remain unidentified, with the protesters laying the blame on Right Sector activists.